Conor and his Dad, Stephen. Conor Holt brings over 30 years of running and coaching experience and is excited to be part of the 'Run with Camille' coaching team. 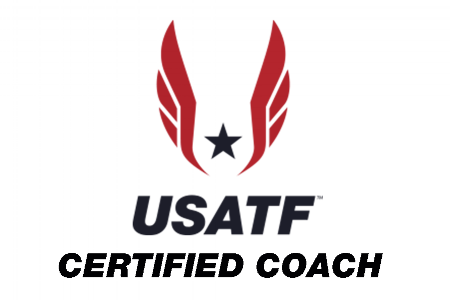 Conor is a USATF Level 3 and IAAF Level 5 Endurance Certified Coach and is very fortunate to have worked with some of the best coaches in running and have learned the science and why/how of this magic sport. Conor was born and raised in Ireland. His first sport loves growing up were soccer, gaelic football, and swimming. Conor's first experience of running was a mile challenge at the annual primary sports day. Since that day running and coaching has been part of his DNA, being guided and learning from his father who is a renowned running coach in Ireland. He was a 3-time Irish National Champion for 3K/5K and a member of the Irish Junior World Cross Country Team. Conor earned a D1 athletic scholarship to The University of Oklahoma, where he was a six-time All-American and Academic All-American – three times in Cross Country and three times in Track. He finished in the top 14 in the NCAA Cross Country Championship three times and took home the Big 8 Championship in the 10,000 meters in 1996. He went on to run professionally for Asics and Powerbar, achieving personal bests of 13:51 for 5K and 29:02 for 10K. Conor is a two-time winner of the Oklahoma City Memorial Marathon and holds the course record of 2 hours and 22 minutes set in 2004. After becoming a US citizen in 2002, he qualified for the 2004 United States Olympic Marathon Trials, where he finished 18th in a personal best of 2:18:17. Following his own personal success, he began coaching Camille in 2004. Incidentally, one day they went out running together. She didn't return until after him. He later inquired how much she was running and was shocked to find out she was running 70 miles per wk for fun! He started giving her workouts, and her running career quickly took off. She dropped her 5K PR from 19 min. down to low 17 min. within one year. He progressed her mileage and race distances, eventually leading her to qualify for the 2008 Olympic Marathon Trials. He's continued to guide her on a miraculous journey through life and running, reaching the highest level now as a Comrades Champion, multiple World Records, and World titles. Conor brings personal and coaching experiences at all levels that is insurmountable in the sport. Combined with Camille's scientific knowledge and applied experiences, together they hold a wealth of unique expertise and wisdom. Conor is excited to share his winning training formula with others and help runners of all levels reach their running goals and their best runs.